“Here the word trans­lated appears to be used in a broader sense to mean transmitted, which would include not only translation of languages but also copying, editing, deleting from, and adding to documents. The Bible has undergone a much more serious change than merely translation from one language to another.” (BYU Professor Robert J. Matthews, A Bible! A Bible!, 72. Italics in original). So, throughout the history of the Mormon Church members have been told that when Joseph Smith’s teachings deviate from biblical doctrine, it is because the text of the Bible has been carelessly transcribed and deliberately falsified (for a refutation of Smith’s assertion see “The Joseph Smith Translation: Inspired by Whom?”). Therefore, an article published this week by the Associated Press is of interest to those concerned with Mormonism. Through the use of digital technology, researchers were able to unwrap (“virtual unwrapping”) the brittle scroll and read the ancient text, finding passages from the book of Leviticus. “The text discovered in the charred Ein Gedi scroll is ‘100 percent identical’ to the version of the Book of Leviticus that has been in use for centuries, said Dead Sea Scroll scholar Emmanuel Tov from the Hebrew University of Jerusalem, who participated in the study. 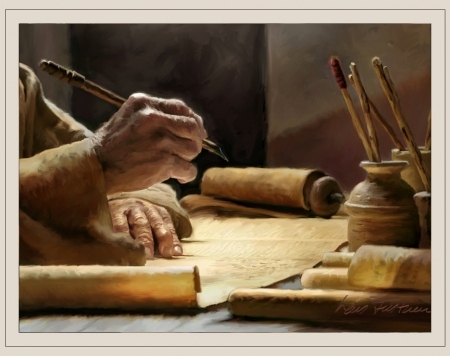 Of course, though the Ein Gedi scroll is ancient, it is many centuries removed from the original writing of Leviticus (believed to be during the 6th century B.C.). Yet, the text has survived the most recent 2,000 years of transcription/transmission and remains 100% unchanged. At the very least, this casts a shadow on Joseph Smith’s assertion of “ignorant translators, careless transcribers, or designing and corrupt priests” who altered the biblical text. “Because of the mutilations of the original text the Prophet concluded…” But this text has not been “mutilated.” In fact, biblical scholarship does not support the assertion of any mutilated biblical text. These basic LDS doctrines stand in opposition to the teachings of the Bible, but Mormons embrace them anyway. Why? Because Joseph Smith said the Bible can’t be trusted. Joseph Smith’s religion would not and could not have ever succeeded if his followers had complete confidence in the Bible. So just like the crafty serpent in Genesis 3:1, the Prophet encouraged doubt in God’s Word – a doubt that continues to be promoted in that church today. Mormonism is what it is because it abandoned the Bible as God’s trustworthy communication of Truth to the world; the eternal hope of every Latter-day Saint is in jeopardy because of it.